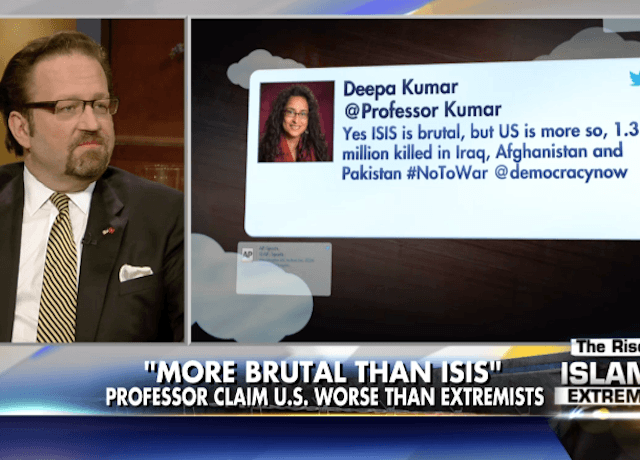 Deepa Kumar, the aforementioned professor, who teaches at Rutgers University in New Jersey–a publicly-funded state-school–has in the past revealed herself as a Marxist and supporter of Palestinian terror group Hamas. She has described the latter group–which still maintains the chief goal in its charter: to exterminate Jews–is to take on the “mantle of national resistance against Israeli occupation of Palestinian lands.” Writing in Socialist Worker, a revolutionary fringe publication, Kumar has suggested that the Hamas terror group would “connect workers’ struggles” and be the ideal representative of a future state of Palestine. “Here’s another example of what has happened to American higher education in the last 30 years. 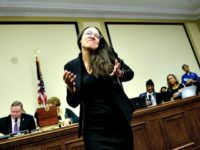 I think she’s just a symptom of what we’ve seen in various tweets, various lectures,” Dr. Gorka said of Kumar, describing her as a professor who seeks to “demolish the history of America” and what it has done to better the world in the last 100 years. So ISIS, which is crucifying people; which is killing children who aren’t fasting during Ramadan; that has used detonation cord to decapitate their prisoners… a nation that saved Europe twice in the last hundred years, and even in the 1990s saved the Muslims of Bosnia. This is the rewriting of history we always see from the left. The Marine Corps University professor pointed to a website, Ratemyprofessors.com, where students weighed in on Kumar as a lecturer that is ideologically driven and forces students to buy her own book. Dr. Gorka finished his segment, reminding the audience of professor Kumar’s radical past, including her support for Hamas. “This is an individual who has written that Hamas should not be registered as a terrorist organization by the U.S government. This is an organization that is part of, that is affiliated with the Muslim Brotherhood,” Gorka said of the Rutgers professors who led the successful movement to ban former Secretary of State Condoleezza Rice from speaking at a recent Rutgers commencement. “But to her, it’s just a political party,” he added.